I estimate that I have another 8 hours to go before I complete my En Provence quilt top. The pattern is still available HERE through the end of the month. Block #13 is sewn into rows, waiting to be finished. But I haven’t turned my sewing machine on today. Instead of I’ve been cleaning. Back at the end of the year, Task One of the final count down was to get your stash under control. Task Two was tackle the flat surfaces. For me these two tasks are basically the same thing. Invariably there are piles of fabric laying around at the point I finish a quilt top — or get it to a stopping point. My Allietare and En Provence fabrics were stacked here and there, not that either top is finished, but both are to the point where I know what fabric will be needed to complete them. So, I allowed myself to get distracted. I’ve been folding fabric. This is supposed to be the ‘floral’ box, but given the red & green box is stuffed, I’ve hijacked the box temporarily. I’ve also hijacked the black and white & red and white box, moving that fabric into this box. Which has made room for the larger pieces of fabric. 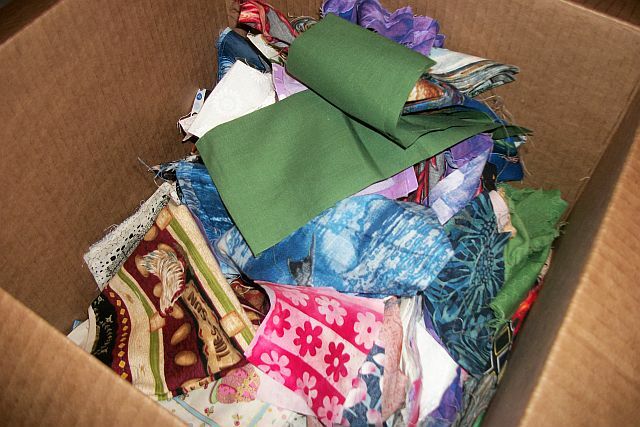 I can’t say that all of the loose fabric is folded – I forgot about this box of fabric and the pile under the lid, but I have cleared the shelves of loose fabric – except for the binding fabric for the Disappearing 9-Patch. Now I have a pile of fabric which needs to be cut up into strips, bricks and squares. But I think I want to consider what exactly I made be making next. Why yes, I’m thinking about a new quilt. I’m considering using these 4-patches as the starter. I don’t really have enough to do anything — yet. 43 3-inch black and white 4-patches and 32 red and white 4-patches. I have red fabric that needs to be cut into strips on the ironing board, there is white fabric on top of the shoe box and in the box is some black fabric. Now, to figure out a quilt design. Or I can spend my next 8 hours quilting and finish the En Provence quilt top so I can get to quilting the Disappearing 9-patch. Shelly over at Prairie Moon Quilts is again hosting the Final Countdown — a set of tasks to clear the deck so to speak to get us ready to quilt in the new year. It’s a good thing she’s given us until the 6th to do this. As weird as last year was I really haven’t given it much thought and it doesn’t look like I was committed to anything. Blogging was minimal, no ‘quilt’ finishes, although I did make a bunch of zipper pouches and a Bionic Gear Bag — that was back in the summer and the fabric is STILL sitting out on my flat surfaces — you know the ones that were part of Task Two? My UFO count – both tops needing to be quilted and tops I’m still piecing has gone up – by a total of 5 — if my notes are correct. Bottomline there are 25 quilt tops in the queue and another 32 quilts I’m still piecing, including En Provence which I started Thanksgiving weekend. 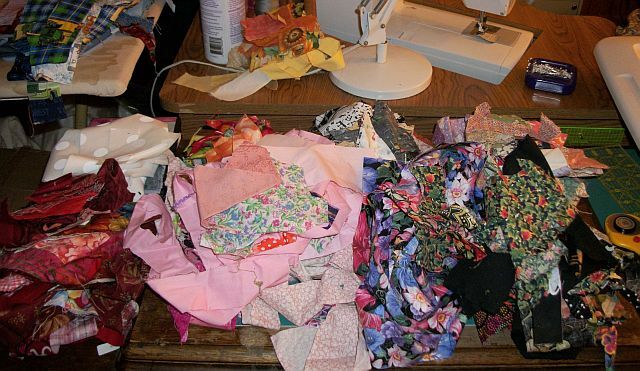 Scraps and fabric is all over the place — I have piles of fabric from both Allietare and En Provence sitting about as neither quilt top is completed. The fabric from the BGB is still sitting out as I planned to make some accessories to go with it. Shoot, my bag from the quilt retreat is still half packed. Complete the En Provence Mystery Quilt top – I’m working on the last two clues now. Quilt the Blue Disappearing 9-patch. The top was finished in January and the pieced backing sometime the first half of the year. I’ve dug out the backing and removed the cat hair. Now both the top and backing need to be pressed and sandwiched together so I can quilt it. The Green and Cream quilt. This was a Christmas 2015 UFO! I unearthed it while working on the space between the cutting board and the designwall. The blue and green Strip Twist. 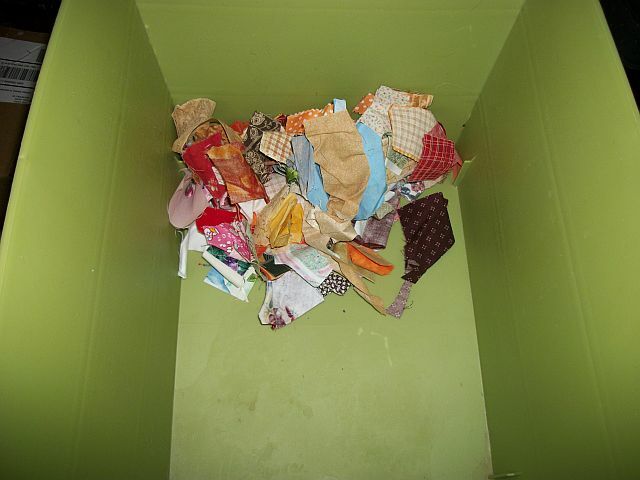 Process the boxes of fabric scraps into the Scrap Users System. This will need to be a long-term project as I have the equivalent of 4 or 5 book boxes (if not more) worth of scraps and my pre-cut scraps are getting thin. This task also includes putting away the fabric that is laying out and about. Determine what I’m going to do with the upholstery samples I picked up off of CraigsList. There are 3 boxes in the garage and in the stack by the design wall. At first glance these are not as usable as the one I made the zipper bags from last summer. If I can stay focused and get these six tasks done I will be thrilled. Stay tuned. Since I seem to not be blogging much this year, I thought I would share a post I wrote on Facebook in the Quiltville’s Open Studio group. One of the first posts I read this morning had to do with what is scrappy. I suspect the post was written as a commentary on marketing of fabric and patterns. So, I thought I would put together a college of some of my ‘scrappy’ quilts. 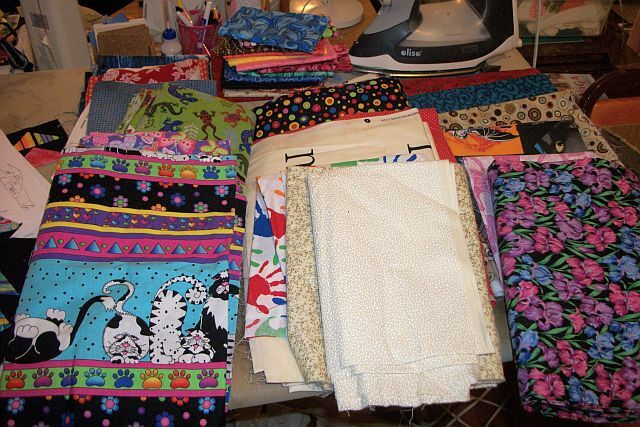 If ‘scrappy’ is defined as ‘left over fabric’ (assuming one can buy fabric to tie it together) all but two of these quilts fit that category – Top Center & Bottom Right — The Top Center were collected FQs specifically for the quilt and the Bottom Right was a FQ stack from the same line of fabric. The top center I use as an example when someone says they ‘don’t like scrappy’. I think it was cut from 12 – 15 FQ of each color. 36 – 45 different fabrics say scrappy to me. If a quilt is not scrappy because the fabric is from the same line there are 3 quilts in the picture that match this criteria (Bottom Row). The Bottom Left are scraps of Kansas Trouble fabrics given to me. The Bottom Center used a Three Sisters charm pack as the basis of the 9-patch – the green and peach are consistent throughout the quilt, but the background is scrappy. The Bottom Right I mentioned previously. The Top Left was made from blues in my stash I think the only thing I purchased was the border fabric. The Top right the black and gold was purchased, the brights were from my scraps. 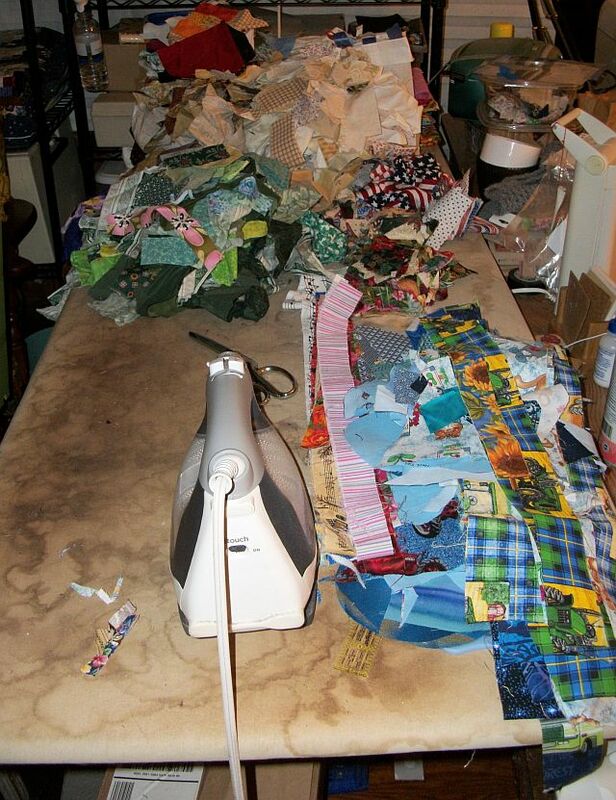 The quilts in the center row are from my scraps, except for the fabric I used to tie them together. 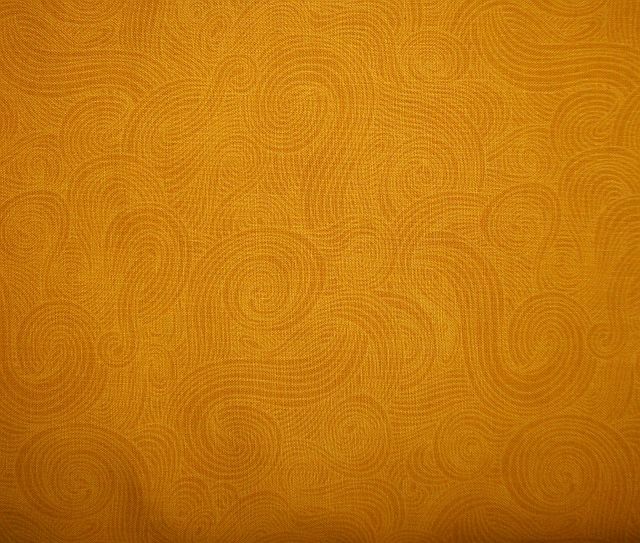 The Left Center uses a constant background fabric. Center quilt uses a purchased red. The Right Center I purchased the gold, red and blue. So bottom line, I think scrappy is in the eye of the viewer. I’ve had people who say they ‘don’t do scrappy’ or ‘I don’t like scrappy’ change their mind when they see what ‘scrappy’ can be. These three quilts were made from my scraps – some pre-cut into squares, rectangles and strips, others from what was left from the FQs which I had previously cut into for another project.The only “yardage” used was the binding — and for all three of these quilts it was left over from another project, or at least not purchased specifically for these quilts. I could come up with more examples of ‘scrappy’, but if you found my blog prior to the first of the year, you know ‘scrappy’ is what I do. I seldom make quilts from a single line of fabric or using just a few fabrics. Off and on all week I’ve been working on the shirt backing. I’m cutting 10-1/2″ and 5-1/2″ squares, then from what’s left, I’m cutting 2″ and 1-1/2″ strips. The rest of the shirt goes into my shirt scrap box. Ideally, I need 90 large squares and 20 small squares as I need the backing to be 95″ x 100″. I think I’ve got 24 large squares cut so far. But I felt the need to piece. So instead of pulling out any of my numerous UFOs that could be worked on, I pulled out Tuscan Sun, the JoAnn BOM from 2006 that my mom collected. I didn’t get far. The pieces are pre-cut, so no thought required there and just what I needed. Unfortunately, either the cutting was off or my piece was off. I suspect it’s a little bit of both. Each quarter section is supposed to measure 8″ unfinished. They do not. So this is going to require a bit of thinking. For now, I think the whole thing is going to get put back in its packaging and put back on the shelf. But I did make progress on the Tumblers. Now back to cutting shirts. See what others are working on over at Patchwork Times. I haven’t done a stash report in a while simply because the numbers haven’t changed. I knew the numbers would change this week, I simply had no idea by how much. The border fabric for the graduation quilt was finally purchased, but I haven’t finished the top yet. This was anticipated. What was completely unexpected was the generous gift of my friend’s scraps. Over 35 pounds! For one of my future quilts I need a length of red fabric and I found it in the boxes. So, that quilt will move up on my list. See how others are doing over at Patchwork Times. Naturally the answer was “Yes”. She said she stick them in a box and bring them to the quilt retreat this weekend. I didn’t get to go to the retreat because I was working this weekend but I did stop by the quilt shop long enough to purchase the border fabric for the graduation quilt. 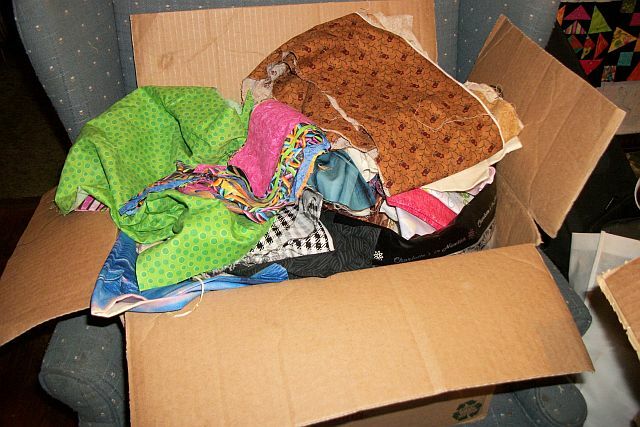 While I was there my friend put 2 BOXES of fabric in my car. I can’t wait to really dig in and play with these fabrics. Here are this week’s stars. The turquoise stripe and the neutrals came from my stash. The rest from the Craigslist scraps. This mess can only mean one thing. I’m digging for fabrics for my Star-A-Day quilt — the one that’s apparently going to take at least 2 years to piece if I don’t get a move on it. I’m digging through the scraps I got off Craigslist for the prints and my stash for the neutrals. fortunately I’m finding some neutrals in the scraps as well. Yes, 9 yards of fabric was received in this past week. But I got Scrappy Trips quilted and bound, made a pillowcase to go with it and put the borders on my Christmas BOM. Which is just over 6 yards. So there’s still more fabric in for the year than used, but I’ll have another quilt top quilted & bound and a pillowcase by the end of the week which should put me with more used than brought in – at least until I pick up the background fabric I’ve ordered for a new quilt. As for the habit of working on my scraps for 30 minutes each week, I only got 15 minutes in this week. I suspect with another 15 minutes I won’t have room to store the shorter pieces in the box and will need to stop and cut them down. 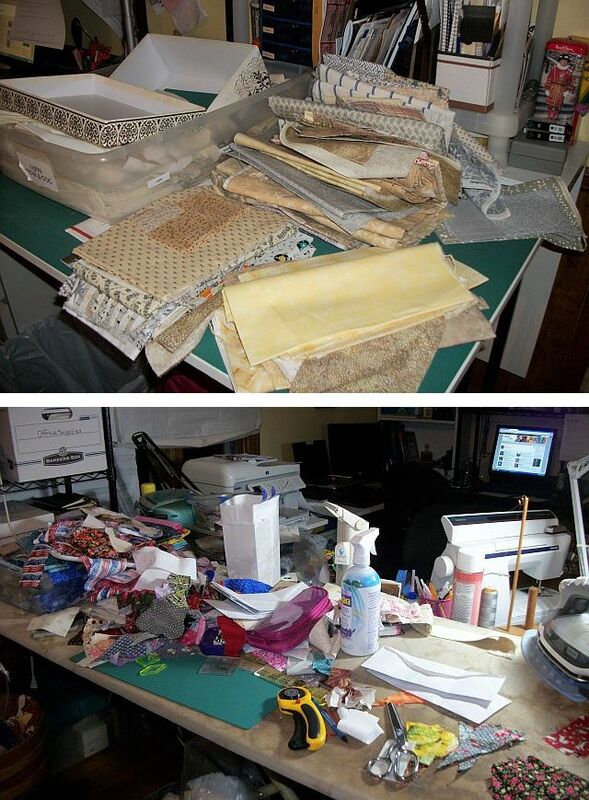 See how others are doing with their stashes by following the links over at Patchwork Times.